The very successful, though single-player title, indie game Spelunky from the PC will be making the much anticipated shift to the consoles. 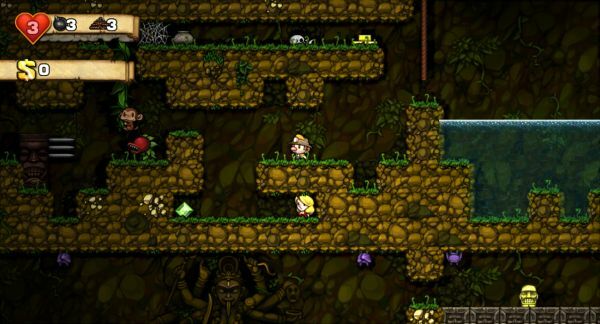 Spelunky is a puzzle platformer that takes place in caves, featuring a spelunker. The title has received a lot of attention, and been recently announced on the Xbox LIVE Arcade. During GDC 2011 a few websites noticed a screens that showed multiple players in the game. There is certainly no confirmation yet, but it’s looking like Spelunky may be co-op when it moves to XBLA. The developer Roguelike hasn’t said anything for sure, but claims they’ll be announcing something soon. Joystiq is claiming there will be a 4-player local multiplayer mode, we're hoping that means co-op.